Joey King's new stylist is Jared Eng of Just Jared and her style has definitely stepped up. The actress walked away a winner yesterday evening(March 23rd) at Nickelodeon's 2019 Kids' Choice Awards at the USC Galen Center in LA. The young styled rocked an chic, edgy and bold look courtesy of JACQUEMUS. 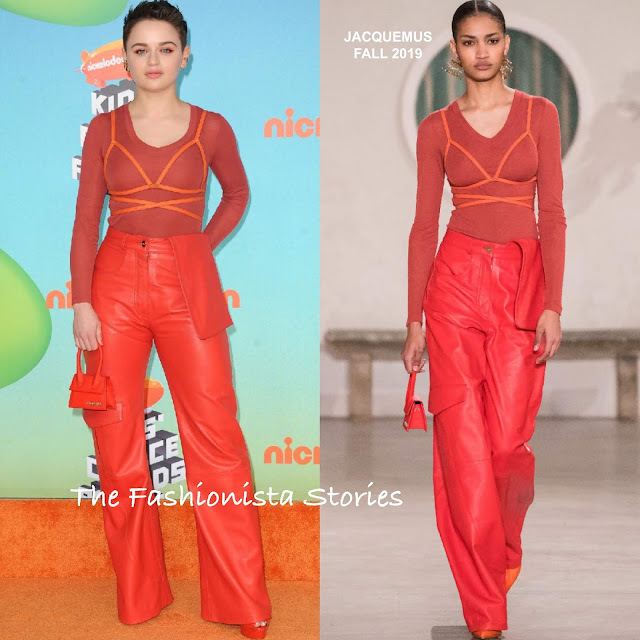 Her FALL 2019 ensemble featured the 'Piombino' knit top which was layered with an spider-back leather harness, red high-waisted cargo pants and the 'Le Chiquito' leather bag. I know some people maybe weary of the harness look but I love this and Joey is selling it. She completed her look with red CASADEI heels.